For most photographers, finding the right moment to press the shutter is crucial. Dayle Record, whose large, color photographs of the Great Salt Lake, Singular Images: The Lake I Love, are currently on display in Charley Hafen’s cozy, brick-and-glass jewel box of a gallery, handles the critical moment like a painter who first draws her subject, then waits until the sun is right to limn the light and capture the defining moment. In the imagination, one sees her motionless on the lakeshore, her camera pointed at a favorite view for hour after hour, selecting instants from the continuum of time, then back in her studio, choosing from a handful of images the one that she will make into a one-of-a-kind print. Advance notice for this show mistakenly implied that Record would be showing ‘altered’ photos. In fact, while she practices straight photography, each vista comprises a single print she will not duplicate. Such was, of course, the rule in the early days of photography, when each daguerreotype was a unique, positive image, and the only way to make another was to take a second photo. Since then, some photographers have limited the prints that could be made of their works, even going so far as to destroy the negatives. In the digital age, the whole idea of an original has to be reconsidered. For Record, the solitary print is a metaphor for the single act of looking. Sunrise, sunset, squall: these things happen often, yet each time they are witnessed is unique. A photograph can become as singular as a painting. 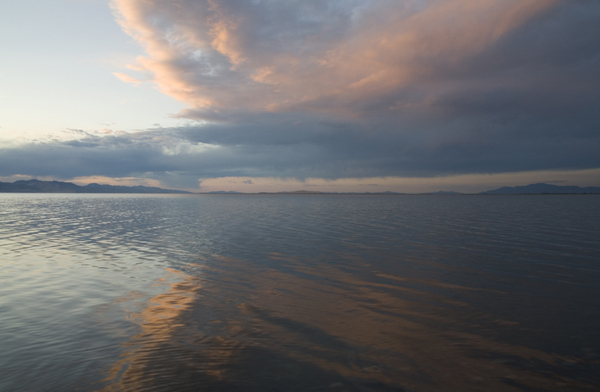 Perhaps the best-known face of the Salt Lake is the one it turns to the sky: a mirror that inverts everything, rounding and completing distant islands that float centered in a spherical heaven. Then the water’s surface becomes a doorway between identical realms locked in conversation. It is Dayle Record’s achievement to go beyond this cliché and set that dialog in motion. She finds those rare seconds when oncoming wind is about to chop the mirror into a conventionally opaque seascape, and in that instant captures two apparently different moments in a single frame. In “Antelope Panorama,” weather closes tightly around the snow-clad island, until stress cracks shiver the lower space. In “Causeway Sunset,” a Baroque sky, full of subtly colored clouds, is reflected by Monet’s impression of that sky: one very obviously made by paint and brush. Sometimes, Record sets in motion a dialogue between what she shows us and the way we already see it in our mind’s eye. When the Spiral Jetty emerged from the lake, patient fans and intrepid visitors were surprised to find it covered in salt resembling snow and ice. Something similar happens in reverse in photographs taken when shoreline features known for every color of the chemical rainbow are covered, not in salt, but in actual snow. Thus domesticated, this eerie swamp landscape, neither fully land nor entirely lake, becomes a place one can imagine loving. 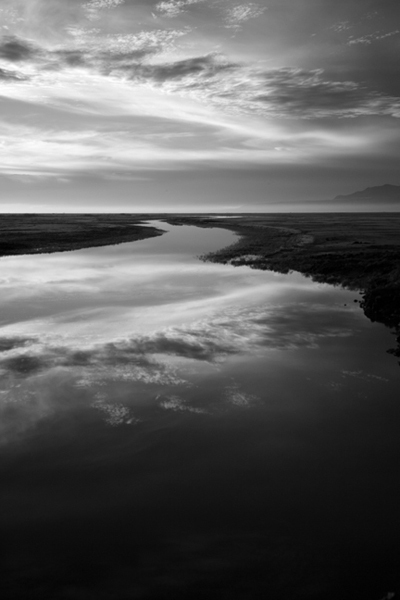 Dayle Record’s Singular Images: The Lake I Love is at Salt Lake’s Charley Hafen Gallery (1409 South 900 East Salt Lake City, UT 84105 | 801.521.7711) through March 9.